Here at Printerette Press, we love hearing from new clients! Whether we're meeting in person at the studio or consulting online, it's common for one of the first few questions to be about the difference in print methods and the cost associated with them. To make that a little easier, we've put together this post. We'll walk through each of the print methods as well as give an estimate for the price. 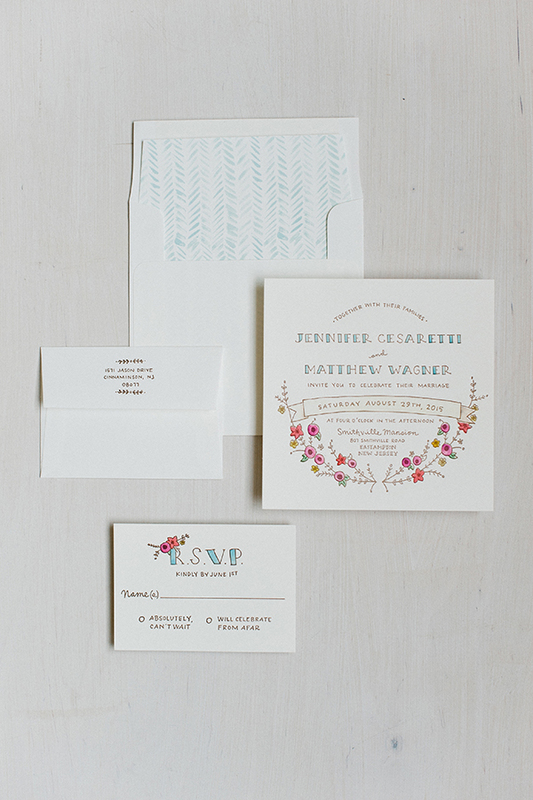 We're using a basic suite that includes 100 invitations and reply cards with blank envelopes. Keep in mind that each order is a little bit different and we put together individual quotes for each order. Each color on a letterpress piece requires its own run through our printing press, and therefore, its own plate. Plates are one of the most essential pieces of a letterpress job. It's what transfers the ink and creates an impression in the paper. 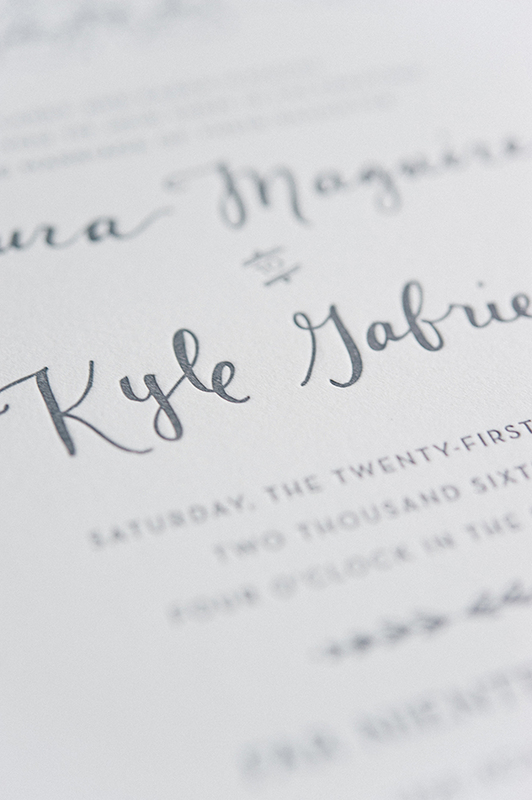 The texture of letterpress printing on the paper is one of the biggest reasons people are drawn to the print method. The bulk of the cost for letterpress comes from the time and labor it takes to set up the machine for each color. It's a very manual process. Everything from cutting the paper and mixing the ink colors, to setting each plate on the machine is done by hand. One of the most difficult tasks is setting the plates correctly. To make sure everything is straight, centered, and aligned can take a few tries to get it perfect. This part of the process is called registration. The more colors we have on a job, the more complicated setting the registration can be, because you're aligning multiple colors as well. For more in-depth information on the entire process, you can read through our Letterpress 101 post here, on Style Me Pretty. 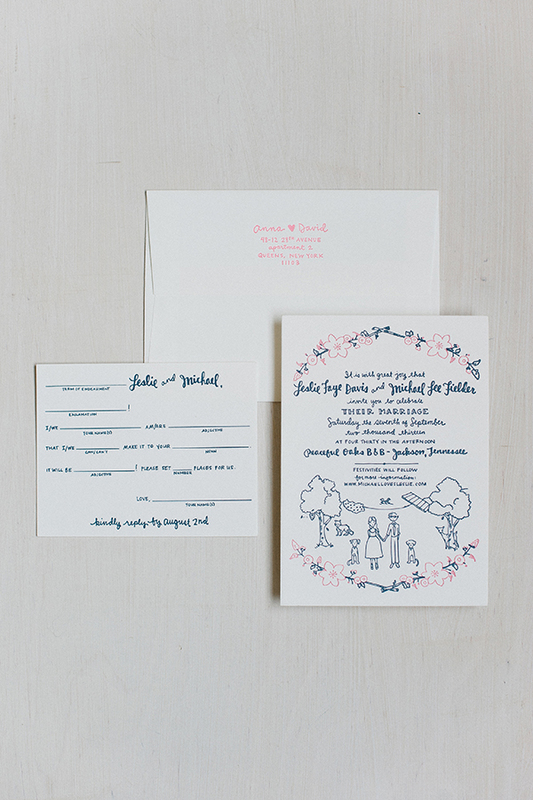 For this suite, we created a plate for navy ink (portrait, text and borders) and a plate for the pink ink (floral embelishment) for each piece of paper. In this case, we will run invitation through the machine twice. The total cost for a suite like this would be about $1300. 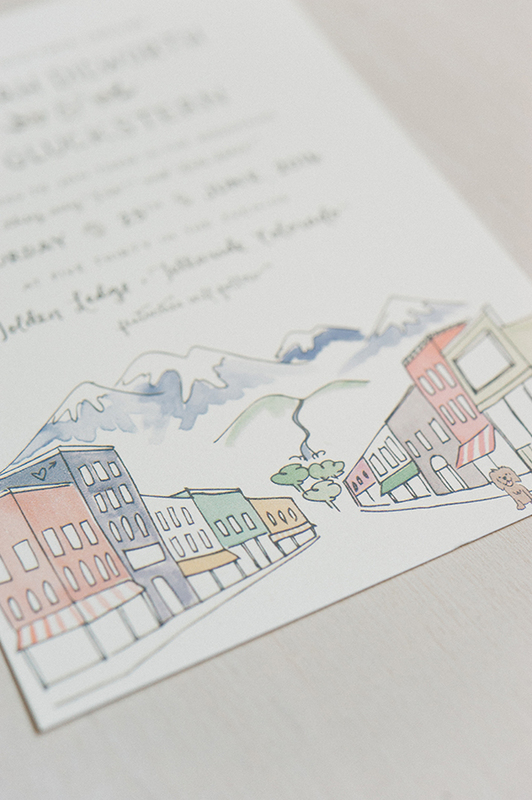 In this suite, we used the same color ink for all parts of the invitation. This means creating one plate for each piece of paper and running it through the machine a single time. With the reduced labor involved, the total cost for the suite would be roughly $1100. 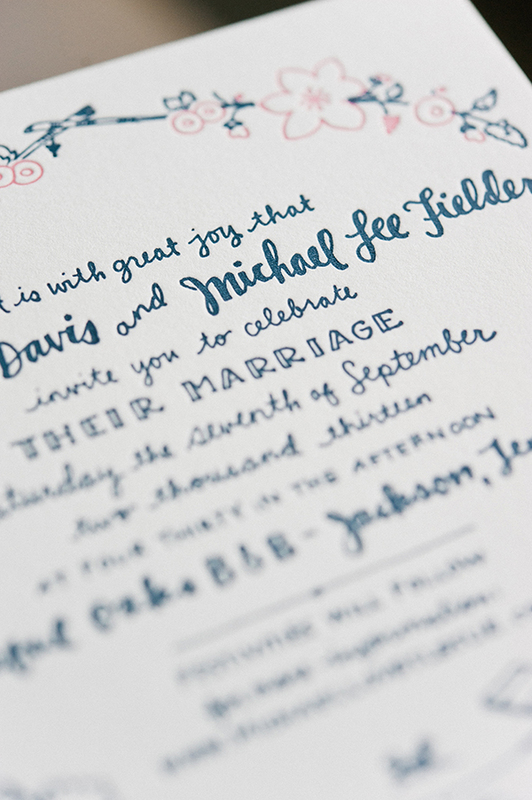 Mixing digital watercolor with letterpress has become one of our most frequently requested print methods. It gives you the range of color from the water color illustrations as well as the textured impression from letterpress. In this case, we digitally print custom watercolor illustrations and then create plates for the text and details. While we run the paper through the machine once, there is the added cost of the digital printing. It can also be more complicated to set up the machines to align all the details, and therefore more labor. For example, on this suite the outlines and inner details on all of the flowers were letterpress printed on top of the watercolor flowers. We usually spend the most time on setting up these orders to maintain that outline and check the prints several time during printing. The total cost on this suite is around $1300. Foil printing is a great way to add metallic accents to your invitation suite. It's very similar to the letterpress process, however instead of using ink, a combination of heat and metal plates are used to transfer the metallic foil on to paper. This technique can be added to any of the print methods we've talked through. Since the foil and metal plates required for this method are a bit more expensive, it adds a bit more in cost to include. 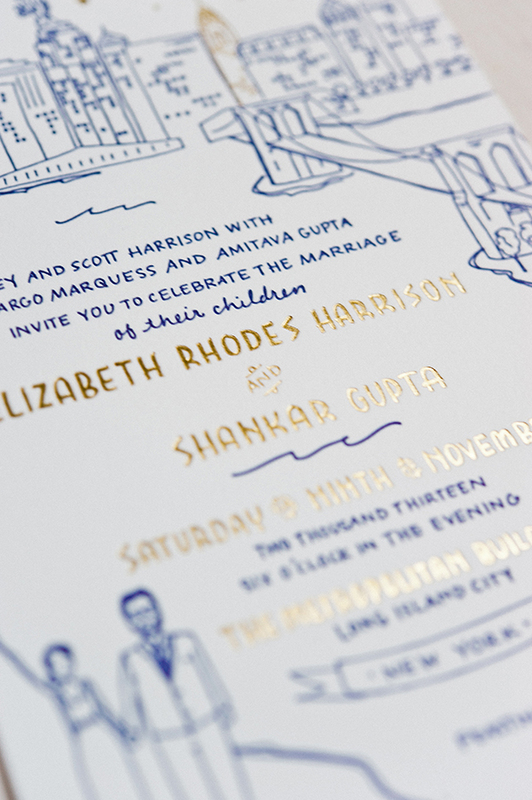 In this instance, the blue of this was run through the machine once for traditional letterpress and then sent through a second time on our foil machine to create the gold names and details for the skyline. The reply card is 1-color letterpress. The total cost of this suite is a bit over $1350. We hope by now you feel a bit more like a letterpress expert! We pride ourselves on putting together custom quotes for each client based on their individual paper needs. It's possible to mix and match different print methods as well as work in any quantity from 50 - 500+. We also love creating custom suites from scratch or even re-creating one of our favorites for your celebration. While we touched on invitations and RSVP cards, we offer plenty of other invitation pieces and day of paper options you may need. To contact us and get started on your own quote, shoot us an email at hello@printerettepress.com , we can't wait to hear from you!